This new book targets embedded developers that want to use the latest release of the Windows CE/Windows Embedded Compact OS family. It has been written by Samuel Phung (that wrote also the excellent “Professional Windows CE 6.0”), Thierry Joubert and David Jones (that released many very useful tools for Windows Embedded in the past). They are great developers and also very good trainers and writers, and I’m pretty sure that they will provide a great amount of knowledge to people wanting to discover the (embedded) “dark side” of computing. You can find more information (and buy it, of course!) on its amazon page or on the publisher (Wrox) website. 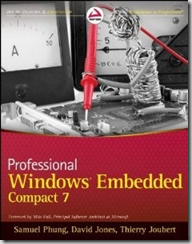 "Windows Embedded Compact 7" "Silverlight for Windows Embedded"